Chicken (or Turkey) Pot Pie Soup! 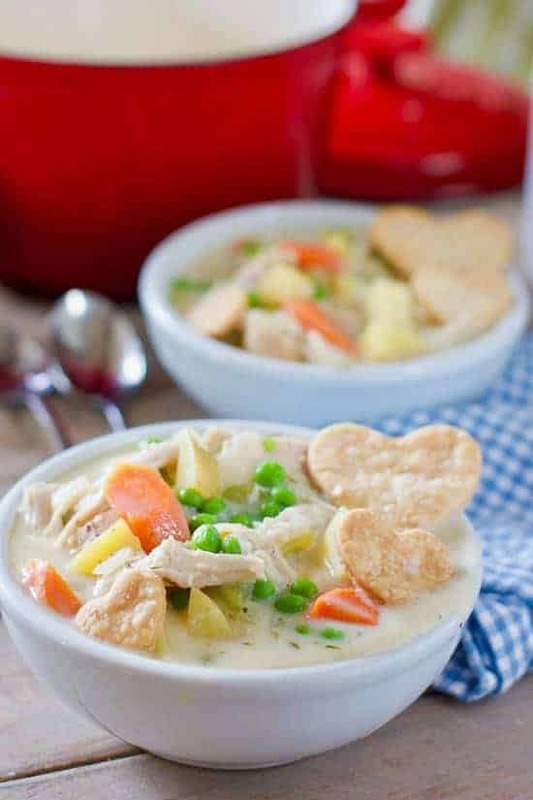 – This easy and fresh soup tastes like chicken pot pie only in soup form! This soup is gonna make you and your family happy for days! It comes together in a flash using store bought rotisserie chicken or any leftover chicken will do. 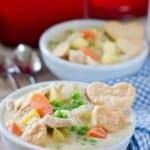 This recipe makes Chicken OR Turkey Pot Pie Soup! We love our soup around here. I am a soupateer, a master of the broth, a soupanaut…or soupanut 🙂 At any rate, I love soup! In fact, soup is the reason I started a blog. I was going to have soup only blog, but like usual I got side tracked and started adding all kinds of recipes. I am so easily distracted…especially when food is involved! I make this soup with either store bought rotisserie chicken or left over chicken. We eat a ton of chicken around here…surprised we don’t grow feathers and cluck. 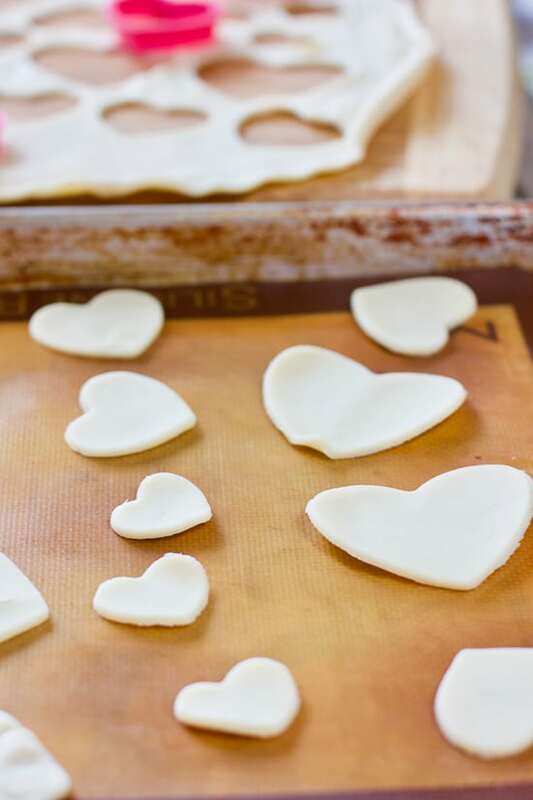 Love the little hearts cut out of store bought pie crust dough. Awwwwww…..
Also love my Silpat liner! See those vague dark circles on it? Those are Peanut Butter Crinkle Cookie bruises…thats how many of those cookies I make! They actually left a mark! You can see all my soups HERE. A couple of our favorites are Creamy Chicken and Wild Rice Soup. An easy and super flavorful soup! And our 30 Minute Minestrone with Sausage! You can make this with most any veggies you have hanging around. To Soup! My favorite food group! Use chicken or turkey in this easy to make family favorite! 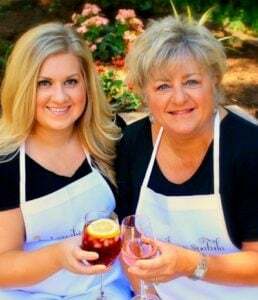 The hearts are made of store bought dough...couldn't get any easier! 1 cup gold potato, diced skin on is fine! salt and pepper to taste. Will depend on if you use low sodium broth or not. Melt butter in large soup pot or dutch oven. Saute onions, carrots and celery until slightly softened. About 5-7 minutes. Add in garlic and continue to cook for another minute. Sprinkle flour over cooked vegetables continuing to cook for 2-3 minutes until no dry flour is visible. Add chicken stock and milk and heat through. Add chicken, potatoes, peas and thyme. Bring to just a simmer and cook until potatoes are soft. TASTE FOR SALT AND PEPPER. Add accordingly. This was tonight’s dinner and it was delicious! Perfect for a cold winter night (windchill of -41 Celsius expected tonight) so a bowl of comfort food soup really hit the spot. First of all, the heart-shaped dough is fricking adorable! Second, I can’t even explain how comforting this soup looks! The PNW isn’t as cold as the rest of the country (at the moment) but I can imagine how wonderful this soup tastes after being out in the rain. What a sweet note! Thank you so much! We had an odd 61 degree day here in Seattle today- very strange, still cloudy nonetheless. 🙂 Enjoy!! Hope you get a chance to try it Christina!